Next got a game high 31 points and 10 rebounds double double from Killven Solomon to sweep their series with Winning Mentality, following a 99-77 triumph, becoming the first team to sweep a series in the Hon. 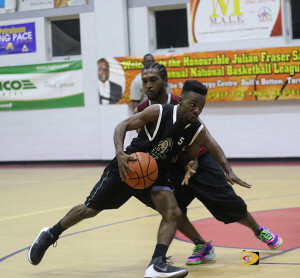 Julian Fraser Save The Seed Basketball League best of three playoffs. Rebelto James and Raheem Blyden contributed 14 and 13 points a piece. Rudy Vanterpool had 27 points and pulled 17 off the glass for Winning Mentality. Tafari Winchester poured in 15 to the tally. Bayside Blazers pulled out a thrilling 89-88 victory on Sunday night in the first game of of theie series for their third straight victory over their rivals this season. They will meet again on Friday night. Jevon Serrant and Destroy Manswell led Bayside Blazers with 16 points a piece—with Serrant knocking down four 3-pointers and Manswell grabbing 16 boards for the 2014 champs. Kyle Abraham followed up with 15 and Tavon Phillip, 13. Douron Phillips and Nicols Charles were the defending champs West Gunners leading scorers with 22 points respectively. Ray Victor added 20 points to go with seven assists. The Splash Brothers flogged We Dem Boys, 99-55, to take a 1-0 lead in their series behind Aubrey Daniel’s game high 29 points. He narrowly missed a double double with nine rebounds. Michael Benjamin and Ashield Frett added 18 points respectively. Frett also had 10 rebounds and dished out six assists. Lenroy Grant was We Dem Boys only player in double figures with 11 points. The Splash Brothers vs We Dem Boys winner will face Next. Momentum overcame a game one eight points loss to even their series with Warrias, following a 73-69 victory. Travis Issac had 28 points to go with eight rebounds and seven assists in the series evening victory for Momentum. Louie Plobete followed up with 15. St. Thomas’ Kitwanna Rhymer who top scored in game one, added 10 to the tally and pulled 12 boards. Shaquille Fonseca had 23 points to lead the Warrias scores on five 3-pointers. Juan Hatchett added a 19 points and 14 rebounds double double.